Love was in the air at the KICC this past Saturday as singletons from across Nairobi came together for a record-setting speed dating event. Over 500 people – including celebrities like Obinna and Betty Kyalo – took part in the successful event which was organised by online retail company Jumia. With Valentine’s Day around the corner, there was no better time to try out speed dating for the first time. I was a mix of nerves and excitement as I walked into the venue, and as it turns out, the event packed some delightful surprises for everyone in attendance. Here’s how it all went down. So this is the gist, there are sets of tables and chairs with the chairs set across each other. For this one, Jumia aimed to break the Guinness World Record for the largest speed dating event which currently stands at 651 participants. The set up was big since the organizer anticipated to get at least 700 participants. Did it break the world record? No. But even though we didn’t get to break the world record, the turnout was huge which meant everyone had a pretty good chance of meeting at least one person with whom they bonded. We were each given a piece paper on which to write the person’s name and contacts and the type of relationship you’d want to have with them. At the end of the event, if you have a match with someone, you can exchange details and take it from there. The event took place at KICC Tsavo Ball Room and the set up was beautiful. From the gate, there were colourful love paintings on the ground leading you to the event location. You could easily tell who was going to the event because of the dressing, but I’ll talk about the fashion later on. The ticket validation was smooth then you proceeded to get a sticky note with your name on it. After that, came the photo booth and then followed the bar. There were two areas where the event took place, the first room was where everyone gathered mingling, before transitioning to the main room where the actual speed dating took place. The age range for this event was designated as 21-35. Although it was a disappointment to see people younger than that find themselves inside. The organizers could have done a better job to filter them out. A few of us ladies had to ask to be relocated to other tables because the only guys we were meeting were 19-year-old’s fresh out of high school. No joke, but damn, the ladies didn’t come to play. With the White theme for ladies and Black for gents, I have to give this one to the ladies. Not that the gents weren’t impressive themselves. I was one of the few who broke the rules and wasn’t in white like the other ladies but hey, like I said, it’s all about standing out, make them remember you. Well maybe, because it wasn’t half bad. If you can handle dating apps, then this is a walk in the park. There’s little to lose and a lot to gain after all. 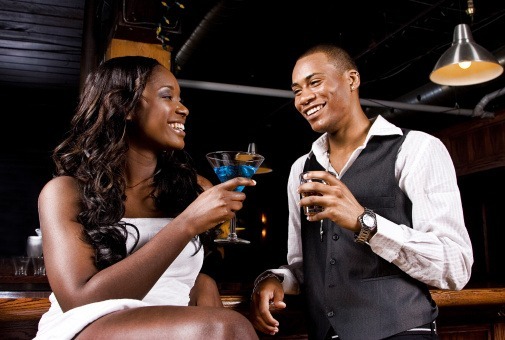 If anything, you’ll walk away from this experience feeling more confident about dating. For me, this was a fairly good dip in the pond. Whether you end up leaving with your new found love or friend, at the end of the day you’ll have met someone new. It’s amazing how one can tell within minutes if they’re compatible with someone else or not. At the end of the day I went home with butterflies in my stomach about this cute guy I had met, who I couldn’t wait to hear from – again.